Great local Belgian-style canned beers are here! I’m not even sure how long ago it was the rumor first came out that Triangle Brewery was planning on releasing their beers in cans. It honestly doesn’t even matter now, the day has come, and Belgian Golden and Belgian White are available at Sam’s Quik Shop. I remember a few years back when Sam’s carried a limited amount of 22oz bombers that were hand-filled and labeled at the brewery. I did purchase a bottle of their wonderful Imperial Red, one I REALLY hope to see released in the can at some point, but was apprehensive to pay $8.99 for 22oz of their Belgian Golden when I could get a pint on-tap at Flying Saucer on Sunday and Monday for $3. Luckily, now, for that same $8.99 you can get 72oz of this great beer! Canning of craft beer has been very slow to catch on since Oskar Blues Brewery out of Lyons, Colorado pioneered the practice in 2002. There has long been a misconception that cans impart a metallic taste to any beer that’s held inside. In fact, modern cans contain a water-based plastic coating, so the beer never contacts the metal aside from the few seconds it’s being properly poured into a glass. There is also some large benefits that cans hold over bottles. There is far less extra space inside the can leftover after it is filled with beer, leading to less potential oxidation. Cans also completely shield the beer from outside elements such as light and oxygen. Not to mention the reduction in shipping costs, the greater ease in recycling, and the fact that cans are easier to take to the pool, the beach, or the golf course. While canning is still slowly being adopted in the craft beer industry, more breweries seem to be getting on the bandwagon all the time. Surly Brewing out of Minnesota had been making exceptional beer and releasing it in cans for almost 4 years now. Ska Brewing out of Durango, Colorado has released their ESB in cans for a few years now as well as recently adding their IPA. Many other well established breweries such as Avery and Boulder Brewing are currently in the process of adding cans to their lineup. The biggest surprise, however, is that Jim Koch of Boston Beer, who had long made the pledge that his beer would never be sold in cans, is rumored to be planning to release Sam Adams Boston Lager in cans. I also have to mention Durham’s only other active brewery, the newly launched Fullsteam, who also hopes to have a canning line up and running in the not too distant future. I for one, am certainly looking forward to that! 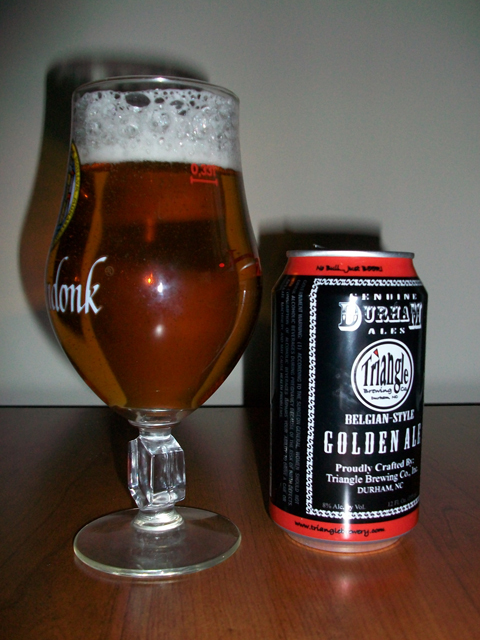 The first of Triangle’s two canned releases that I tried was the heavier (and personal favorite) of the two, Belgian Golden. The 12oz can was into a Corsendonk tulip pours a crisp, bubbly pale orange with a nice frothy off white head that slowly diminished to a thin layer and then a ring and left decent lacing on the glass. The aroma wass a nice blend of sweet malts, sweet fruits, citrus hops and mild spice. The taste wass a nice amount of sweet malts with a nice hop balance with a decent amount of earthy citrus hops. The beer was medium bodied with its 8% abv quite well hidden. With this beer being that tasty and easy to drink, along with the great price, I must say that I will likely be keeping this beer on hand in my beer fridge quite regularly. 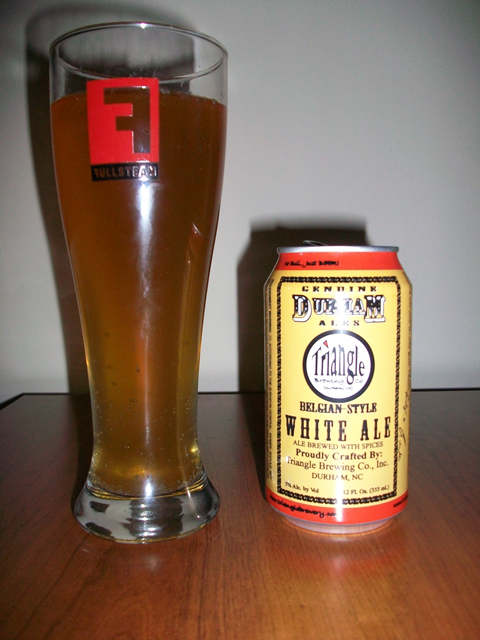 I then poured the Belgian White into my Fullsteam weizen glass that I purchased at their opening day party. I’ll admit that Witbiers are far from my favorite style, that doesn’t mean that I don’t enjoy one from time to time and know a good one when I try one. This one poured a slightly hazy pale orange with almost no head. Aroma wass sweet malts, wheat and mild spice. The taste was a nice amount of wheat and sweet malts with nice spices such as coriander and orange peel. The beer was quite light bodied with nice smooth carbonation. This wass a very tasty, sessionable beer, one that would be great by the pool, at the beach, or as nice lawnmower beer. This is certainly a Witbier that I can see myself picking up when the mood hits, especially in the summer. I have got to say, I am very excited about the prospect of more great beer being released in cans. They are certainly easier to store in the fridge, easier to recycle, and less likely to leak or break if you’re into trading beer. Not to mention how crisp and well kept they are when you pop one open and pour it into a glass. I have heard many craft beer fans continue to argue that good beer should be bottled, and I say, if you feel that way, just continue to buy bottles. I will still continue to buy bottles, of course. But I will certainly be at least a little more eager to try a new beer if it is available in a can. I hope to see even more breweries get on board. Thanks for the review. I was hoping to hear what everyone thought before making the trek to Sam’s. Seems definitely worth it.